It's the sixteenth series in the World of Springfield. Amazing. 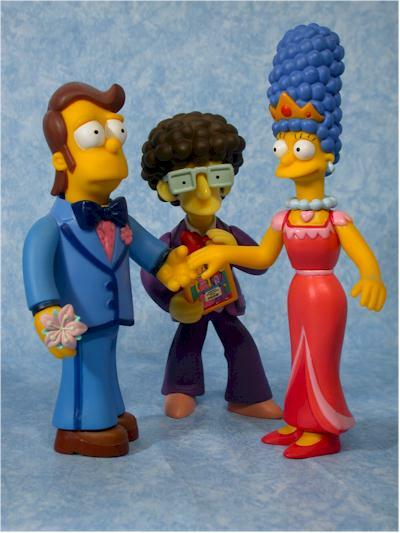 Who would have ever thought that any company could have managed to bring to life not just the A list characters of Springfield, but folks like Disco Stu and Brandine. Easily one of the greatest lines ever produced, it's sad to see it coming to and end. 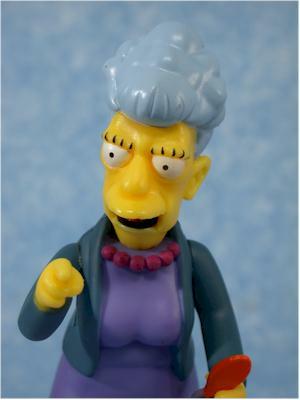 The final full series includes the much anticipated Agnes Skinner, along with the three nerds, Benjamin, Gary and Doug, Artie Ziff, and the variations Evil Homer and Brain Freeze Bart. It's somewhat fitting that the very first series had both Bart and Homer, and the final series does as well. I picked these up at the local Toy R Us for the bargain price of $6 each. That's just a dollar more than they were at their inception over 3 years ago. This wave actually includes seven full size figures, since Benjamin and Gary are packed together. That's fairlly unique (although Sherri and Terri were done as a two pack as well). Electronics Boutique should be shipping these within the next week, and I'm betting Amazon.com starts shipping soon as well. The next - and final - playset will be the Town Square with Jebediah Springfield, and with that release, an era will end. The line only went through one package change in its entire run, and I have to say that the second version was better than the first. I really like the use of the circle faces on the front, and actually only showing the figures from that series, rather than the same generic pictures every time, really spiced things up. The cardbacks aren't great, and they have a tendency to curl, but they aren't the worst in the world. When Playmates does a great figure, one of the things that makes it great is an 'action' pose. With the limited articulation, it's pretty important that the sculpted pose of figure match the personality and character of its on screen persona. If you're looking for examples where that works, look no further than Agnes and Artie. Both of these figures have been give expressions and poses that work perfectly with the character, and in Artie's case, the specific episode. The stances are great, and the hand/arm sculpts on both allow for very specific, but very appropriate, looks. 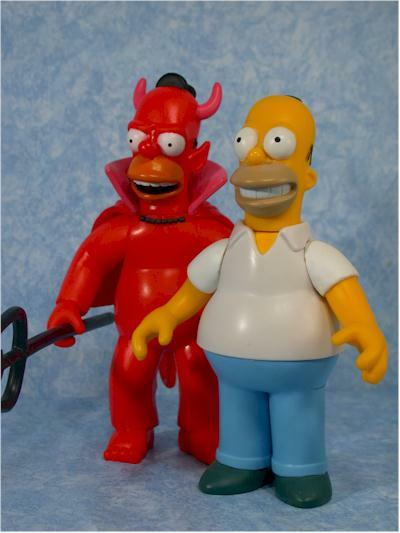 On the complete opposite end of the spectrum is Brain Freeze Bart and Evil Homer. 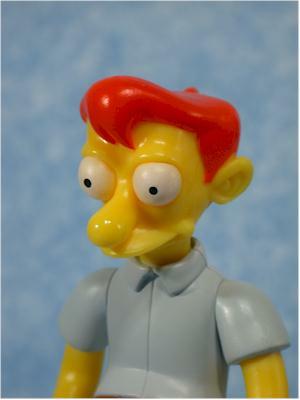 Evil Homer's sculpt isn't technically all that bad, but who is this guy and where is the real Evil Homer? You remember the one, dancing in the cemetery singing "I am E-vil Ho-mer!". This ain't him. His pose is fine, although the facial expression looks more evil than you'd expect. His hands are sculpted in great poses, and he holds his pitchfork just fine. The sculpt isn't all puppy dogs and apple pie though - what's with the huge hairs? He looks like he has a couple dinner plates stuck in his head. And why is this version trimmer than most other Homer's? In the end though, this figure really makes no sense to me. 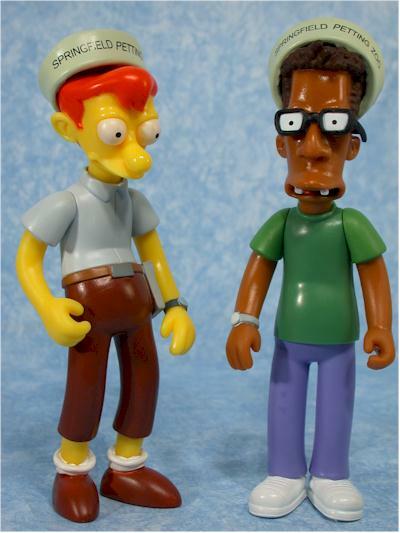 Early on, one of the FOX/Groening edicts was that these figures should always be based on actual characters from actual episodes - no making up silly stuff. But when did we ever see Homer quite like this? Inquiring minds want to know. And now you have an answer - when I asked this question a long time ago (back in December of 03), I was told this was just a screw up with the prototype, and that they were doing the Homer as seen in "The Frying Game". 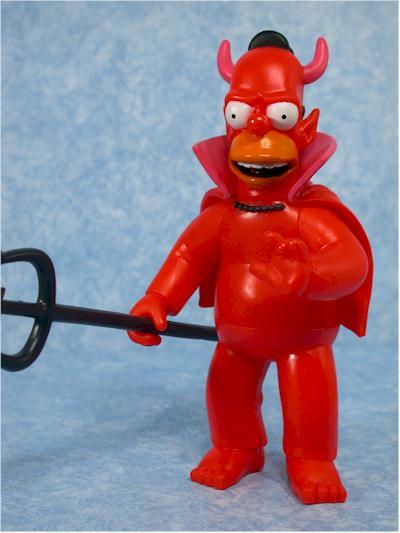 He appears this way as the little devil on Homer's shoulder very early in the episode. 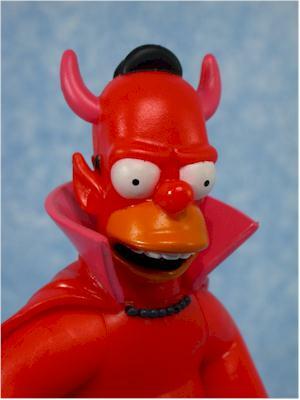 Still this is not the figure that everyone wanted when they asked for Evil Homer, and it's a pretty big disappointment. 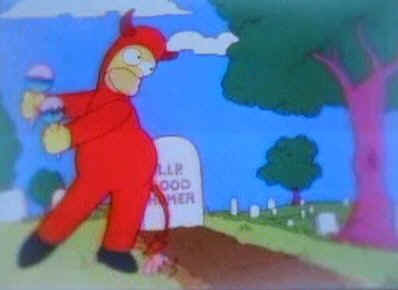 I've included a couple screen captures to show the Evil Homer I wanted, and the one we actually got. On the other hand, we know that Brain Freeze Bart is right out of the show, from the episode Boy Scoutz N the Hood. I'm not sure about the name, since he and Milhouse had gone on a 'squishee bender' that gave them an extreme sugar high. 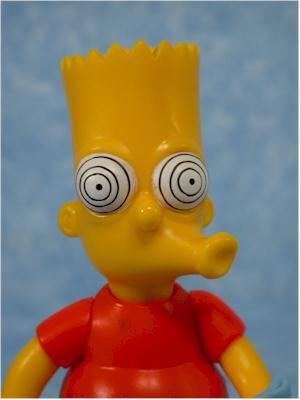 Maybe Playmates and FOX were afraid of actually making it clear on the peg what was happening to Bart here. I guess you might give them extra points for doing a character from an episode parodying the whole drug culture. However, just because he's from an actual episode, that doesn't make this variant okay though. Whoever thought this was a good idea needs to be slapped. Twice. BF Bart is going down in history as the worst Bart variant, battling it out with Kamp Krusty Bart for that auspicious title. Both have their pluses - KKB was at least a reasonable choice, just poorly executed, while BFB was a truly stupid choice, executed somewhat better. And yes, BFB's arms and body are reused, with just the new head sculpt. The three nerds fill out the rest of the series - Benjamin, Gary and Doug. First introduced in "Homer Goes to College", they made several other appearances in later episodes, and represent the nerds and geeks of the world quite admirably. Benjamin and Gary, the skinny nerds, are packed together, while Doug, using up a lot more plastic, is on his own. 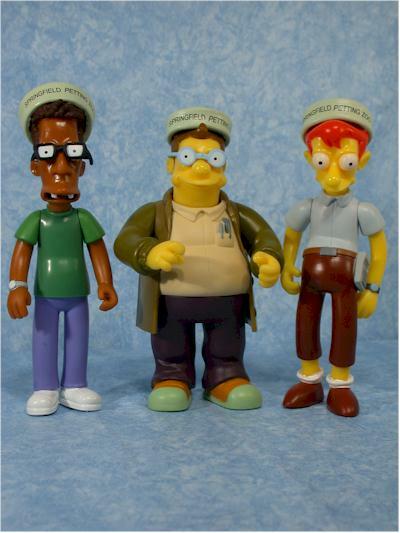 The sculpts on all three are extremely accurate. I love the calculator on the hip, the pocket protectors, and the general all around details that these three have. All the eyes are also sculpted and painted properly under the glasses, a nice touch. These three weren't must haves on my list, but they were well done, and a great addition to the overall set. In general, this is a fairly average outing in the paint department. Most have at least some basic issues with poor definition between colors, and the whites of the eyes are often marked or sloppy. There's occasionally stray marks, and Bart scores lower than the rest of the pack due to some staining on his shirt, deep in the plastic. I think the worst general paint job on my set was with the nerds. Lots of slop around the socks, watches, calculator - just not the kind of quality work we've seen in other series. Then again, this series has always been tremendously hit or miss in this category. The Evil Homer also has the privilege of having the least sensible paint ops. On the packaging, we see him with 'flesh' (yellow) hands, but the figure is all red. Huh? Hey, it shows his cape chain as yellow as well, and that ended up black, so who knows? The final version also matches up with what was seen on the show, so you can't complain too much. Neck, shoulders, waist. Almost the last time I get to repeat that litany. And don't get excited about Homer's tail - it's not bendy. Just in case you were wondering - once this line hit series two, there was no way they could have improved the articulation and not screwed things up. Once a series has a certain look, nothing will kill it faster than breaking that consistency. Oh sure, wrist joints would have been nice to get added, but beyond that, these things were pretty much locked in. The lack of articulation is helped by great sculpting on the arms and body though, like what they've done with Agnes and Artie. Figures that lack that physical expression are hurt even more by the poor articulation. The number and re-use really varies through this series, much more than the average release of WOS. Artie and Agnes are the clear winners, both with the most new accessories and the most appropriate. 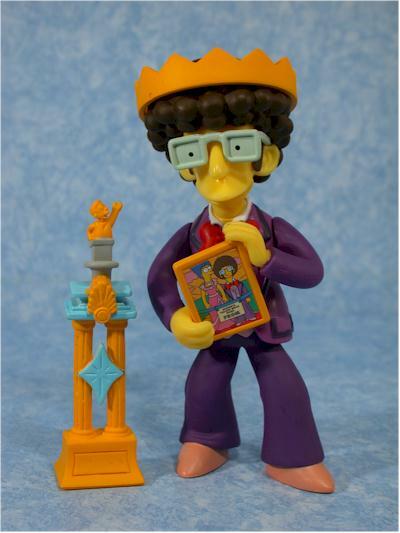 Artie has the prom king crown, trophy, and picture of he and Marge. The crown fits surprisingly well, considering that huge afro of hair, and I love the detail work on the trophy. Agnes comes with picture of Skinner - reused - plus the inflatable neck pillow, keys, and locket. The watch contains two stickers, one of the watch face and one of her. This is probably the watch that Armin Tamzarian/Skinner gave to the real Skinner in the episode "The Principal and the Pauper" (thanks to SBBED for pointing that out!) Her accessories all make sense, come from very specific and interesting episodes, and are great examples of when accessories go right. 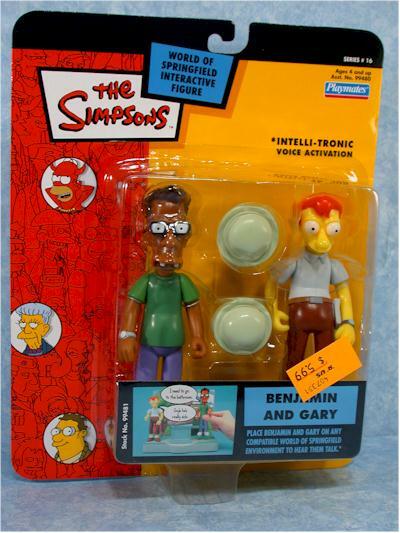 Benjamin and Gary each come with one accessory, but that's not surprising since you're getting two full size and talking figures for just one price. They both have the Springfield Petting Zoo hats, and the fit pretty well on their heads. Doug also has his petting zoo hat, and comes with an extremely well done (at least in cartoon style) desktop computer. 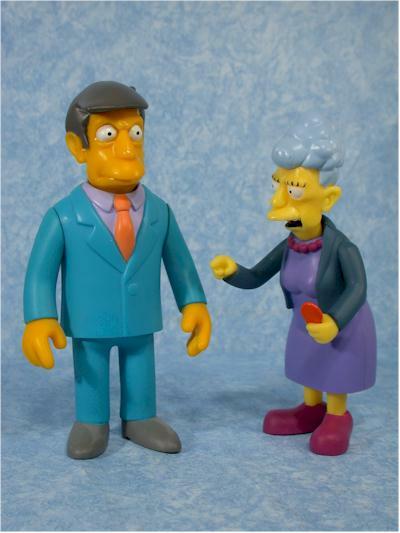 Nice to see we got a new, updated model, rather than the old Coleco version that came with Gil. 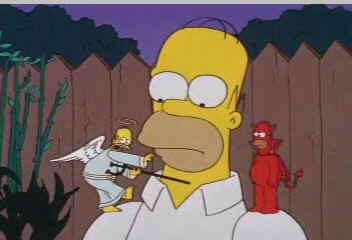 Evil Homer has just one accessory, a pitchfork. And yes, that makes sense. Unfortunately. 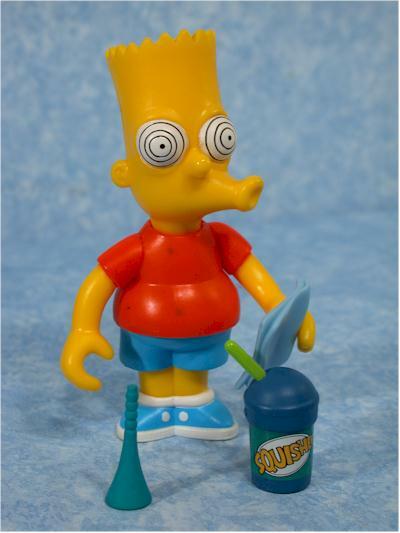 Brain Freeze Bart has three accessories, but two are re-used - the Squishee and the Radioactive Man comic. He comes with a funnel, the only new accessory, but there's something very cool about the comic! It's imprinted "Bongo Comics"! You could also count the glasses on several of these figures as accessories I suppose, since most of the come off, although it takes some work in some cases. They are all attached though, so they don't fall off like Hawkings, etc. Let's face it, the talking feature petered out about half way through the life of the line. While it's always been a nifty idea, matching up figures with playsets and appropriate lines got to be mighty tough. This wave is the perfect example, since there are several figures that would make sense talking on other sets (like Artie on the Prom set), but don't since they weren't in the plans back then. As it is, these all only talk on the soon-to-be-coming Town Square set. Actually, that's not completely true. 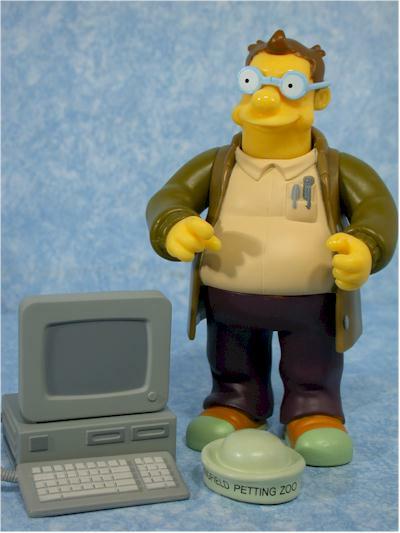 Obviously, both the Homer variant and Bart variant work on all the other sets that work with any Bart and Homer. 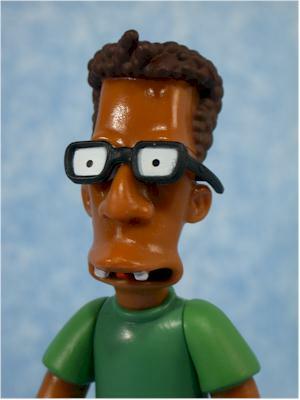 And surprisingly, Artie Ziff has a couple lines on Main Street - "Even wallflowers can look forward to one date a year. 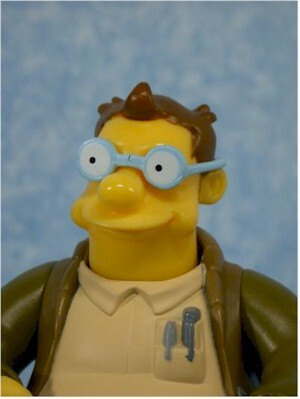 ", "I'm Artie Ziff" - so perhaps there are some other hidden lines in other sets. Gary: "Guys he's really sick." Artie: "There's a difference between ignorance and stupidity." Benjamin: "I need to go to the bathroom." and Doug, my favorite line: "Intruder alert, intruder alert." Hey, I used to love Berserk. Believe it or not, there are kids out there that a) still love the Simpsons and b) play with these toys. I'll admit they are getting fewer by the day, but they are out there. And considering both the talking feature and the cool playsets, this line is fun for all ages. Pick these up at six bucks, and you're getting a really great value. Obviously the Simpsons are not a cheap license, and yet we get a talking feature, plus cool accessories, all at a price $2-$3 less than most other mass market toys. 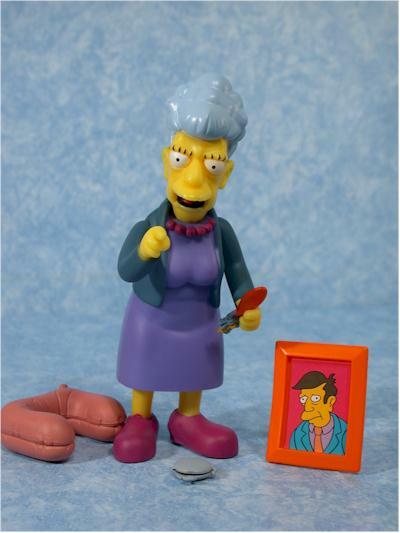 Sure, the value drops with figures like Bart, with lots of re-used parts, but when it comes to a character like Artie or Agnes, you are definitely getting your money's worth. It's sad to see such a successful line come to an end, but it's had one of the best runs ever, and certainly a much better run than anyone ever anticipated or foresaw. While this last series isn't perfect, it does add a couple great figures to the display, three more that are lots of fun, and two...well, they're there. Completists will pick up the entire run, but I suspect lots of folks will be passing on Brain Freeze Bart and Evil Homer. However, a very low production run is likely to still make this whole series disappear fast. I picked them up at Toys R Us, but EBGames.com and Amazon.com have them to ship in the next week or so.